As a blogger traffic is every thing, there are also many ways to get traffic to blog like Search engines (by using SEO tips), by distributing free e-books, advertising, telling friends etc, among of these I think most powerful way is emails list building because 90% blog got traffic from search engines then think even for a while, your blog with out search engines(or organic traffic), then there are only two ways to get traffic that is social media and emails list, but according to me building emails list the best way to drive targeting traffic to blog. This article will really open your eyes, how building emails list will make your blog more popular, in blogging emails addresses are like collecting dollars to make it 1 million even more but here is the thing why? Because after every post your email subscribers will notify that you have created a new post that's why they will come to your blog and finally read your blog post and you will get targeted traffic for free. I think it is a great idea for bloggers to increase visitors and make money, let me tell you some thing more about this, many affiliates are looking for bloggers emails list that's why they can send their product information to the emails list, here I am not telling you to send a product information to your emails to make money, yes I will suggest you to use top Clickbank product to promote on your blog and see the difference in earning. 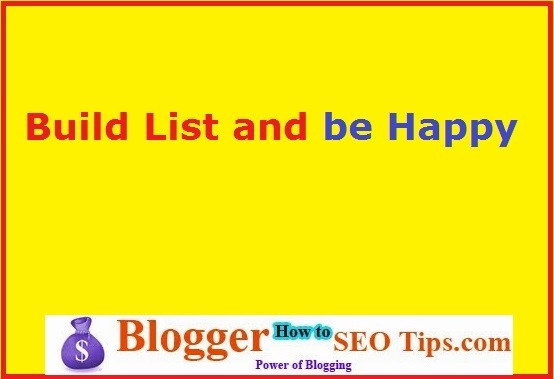 According to me building emails list is a great method to get more traffic and get connected with users. May be you are thinking you need to invest money for building emails or may be you need to learn coding, then you are thinking absolutely wrong because it's free and you don't to do any coding just need to use your Gmail account to use Google Feed Burner to build emails list. Let me give you an example of my blog, I am using this tactic to keep connected this the users, just like I have used feedburner for my blog www.rehut.org from last few months, I have verified subscribers for that blog is about 500 and when I write article on that blog then I got about 50 to 100 visitors to the particular post with out doing anything because it works like an autopilot that is I think awesome, as a blogger you must utilizing this awesome tool for your blog. See, dear I don't have readers base of million, but yes I have readers base in thousands and those are pretty strong followers of my blog, I am sure it will multiply day by day because I am really putting effort behind it and I am sure it will become a more stronger list. Right now, I have a list of 6000 people those are really good readers of my blog and of course they are happy readers of my blog because I have been delivering lot of great content with real time case study that's why they will get benefits from it. I have leverage my readers source like social media, Youtube and other sources too like friends, students and many more. Most important; I have started improving my blog posts day by day and its just enjoying because it is working. Only building list is not good enough to get royal readers, until or unless you will not help them properly, actually its a simple technique which I am going to share with you, if you can implement it then I am sure you will build a BIG list very soon. Every blog post is an opportunity it is on you how you can GRAB every opportunity. Always write from heart and you are going to get up to 100% unique rate, if I tell you I always get more than 95% unique rate and that's really awesome even that's why my blog posts always rank pretty well in search engines. After writing the blog posts real work start, just don't hide your blog post rather try to tell others that you are author of the blog, which will help you to get authority in the internet world. This one is MORE powerful, remember my dear If anybody anything may be good or bad, can you guess who is behind this scene, the person itself. So, think about it, are you ready to do hard work then just get time and start writing and promoting awesome content and make it little better. Recommended for You- Different Between Successful and Unsuccessful People. I hope you got something amazing from this article, well I tried to give you the best what I have? What I know? What I have experienced? and I will be keep trying to motivate you and make you better blogger day by day.